Have a barking-good time exploring maths concepts with this fun- filled, interactive activity book for LeapStart—the interactive learning system designed to get your child ready for school and life. 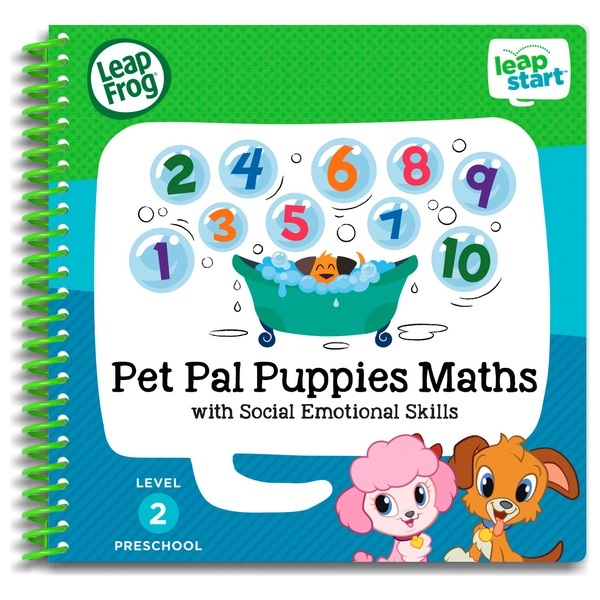 The LeapFrog LeapStart Preschool Pet Pal Puppies Maths and Social Emotional Skills Activity Book is jam-packed with 30+ replayable activities that engage kids ages 3-5 at the Preschool level to keep them playing and learning for hours. With the LeapStart system, every page talks, sings and jokes with exciting audio interactions that bring learning to life. Join the Pet Pal Puppies as they play, race and explore, helping your child understand maths concepts along the way. Take a walk through an apple farm, counting apples as you go. Use number recognition to make music on a xylophone, and then create your own tunes. When it’s time to make mud pies, read the "recipe" and count your ingredients to make sure you have everything you need.